Prior to WW II the Kodak Company had gone to considerable trouble to ensure that the cardboard it used for packaging its film was free of radioactive contamination. Kodak had learned to their dismay that cardboard and paper made from recycled products could be contaminated due to materials originating from the radium industry. For this reason they made arrangements with a paper mill in Indiana to produce cardboard from carefully selected raw materials. Shortly after the atomic bomb was dropped on Hiroshima (August 1945), the Kodak Company observed spotting on film that they traced back to contamination in their cardboard. Dr. J.H. Webb, a Kodak employee, studied the matter and concluded that the contamination must have come from a nuclear explosion somewhere in the U.S. In fact, it came from the world’s first nuclear explosion, the Trinity Test, that took place at Alamogordo New Mexico, July 16 1945. Fallout from the explosion had contaminated the river water that the mill in Indiana had used to manufacture the cardboard pulp. Recognizing the sensitivity of this information, Dr. Webb waited until 1949 before publishing the story in the open literature. As a partial response to the event, the Kodak Company installed air samplers in the intake for their building ventilation system to monitor for fallout. 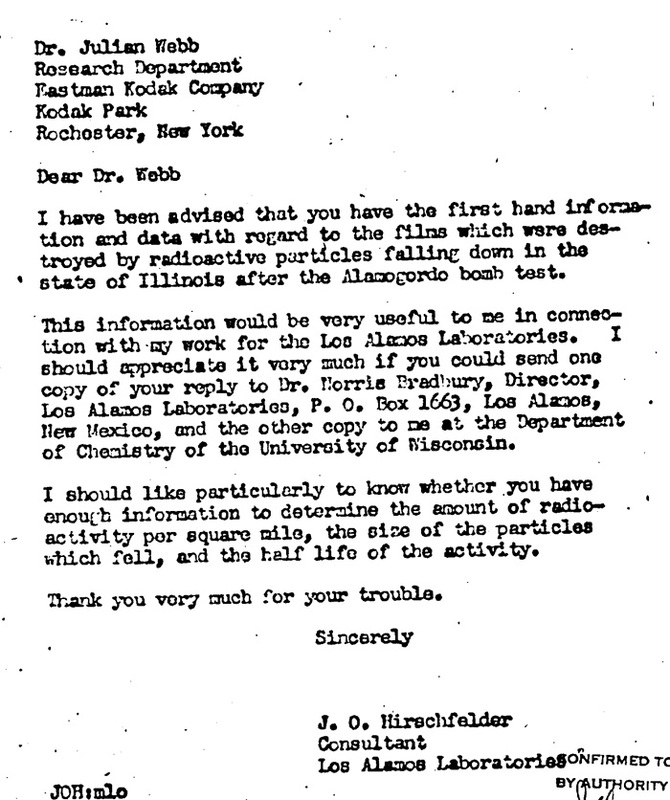 The following declassified letter was written in 1947 by a consultant at Los Alamos to Dr. Webb requesting more information about the incident. Webb, J.H., The Fogging of Photographic Film by Radioactive Contaminants in Cardboard Packaging Materials, Physical Review Vol. 76 (3):375-380, 1949.